Jam. such a simple store cupboard item. Nothing too special? A bit ho-hum? I hear there are people out there who… shh… don’t. like. Jam. Hmm. Jam to me is one of life’s simple pleasures. The simple alchemy of fruit and sugar. It’s a season, captured in a jar. It’s also something that people are scared to make because they think it’s complicated, that they need special equipment. No you don’t. you need a big old pan and a saucer. and a wooden spoon. That’s it. Oh and time. Fruit. Sugar. There is nothing more complicated or time consuming about jam than say, soup. But whereas soup is gone in a couple of meals generally speaking and ‘of the moment’ in terms of flavours, a batch of jam lasts a good long while. Actually not that long with my small boy around but you get the idea. 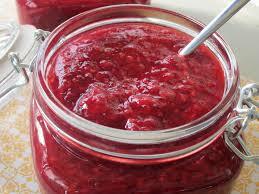 By spending time making jam you are setting yourself up for weeks, if not months of pleasure. I love this about jam. For an hour of your time, a pleasurable hour too, you reap the rewards for aaages. And in the depths of winter you get to relive the summer strawberries, the early autumn plums…In summer you get a sharp hit of seville orange, only found fleetingly in greengrocers for a couple of weeks in January. A faint reminder of Christmas. You can keep it simple with your flavours, a single fruit, like a single estate tea or a single malt is a thing of beauty. But try different combinations of fruit. Add spice, herbs, nuts. I love plum and lavender. Apricot and almond. Blackcurrant and mint. If you want some jam inspiration, check out jamsmith who thinks up amazing flavour combinations and has a flair for the exotic as well as the seasonal and the foraged. and Jam isn’t just for toast. Jam is for stirring into porridge. It’s the bottom of a steamed pudding. It’s a pancake filling. It’s a cocktail ingredient (really!) As a child there was no finer snack that a jam and cheese sandwich. (yes REALLY). When you make jam you are bottling seasons and making memories. I still remember the excitement of ‘greengage jam time’ of year when I was younger, my absolute favourite. And damson. These are not easily shop bought and all the more special for it. My son calls ruby grapefruit marmalade ‘grandma’s jam’ as that’s what grandmas make and give us. He calls my blackcurrant jam ‘black jam’ and begs me to make it when theres not a single blackcurrant to be found! I hope and believe that jam is and will be firmly part of his childhood memories, part of the landscape of the breakfast table, a happy thing. I recently had a wonderful jam related experience, something which has further enhanced my jam love. I wanted to meet up with a girlfriend for a hug, a chat, a laugh. But instead of meeting for coffee in a cafe we met, in her kitchen, with jars and lids and pans and ingredients and even little wax disks. And we made jam. Three hours later we had jars of the stuff and had had a damn good time into the bargain. We had listened to each others news, offered each other advice about children, discussed how stupid homework is, REALLY gone to town on the current UK political situation. We also ate bacon sandwiches. And then, at the end, we also had jam. Lots of jam. And now when I eat the jam I think of her and that morning and I smile. And eat more of the jam. If you’d like to know the HOW of jam rather than my philosophical musings, please leave me a comment and I’ll put together a how to blog post with pictures the next time I make jam. Which will be soon!